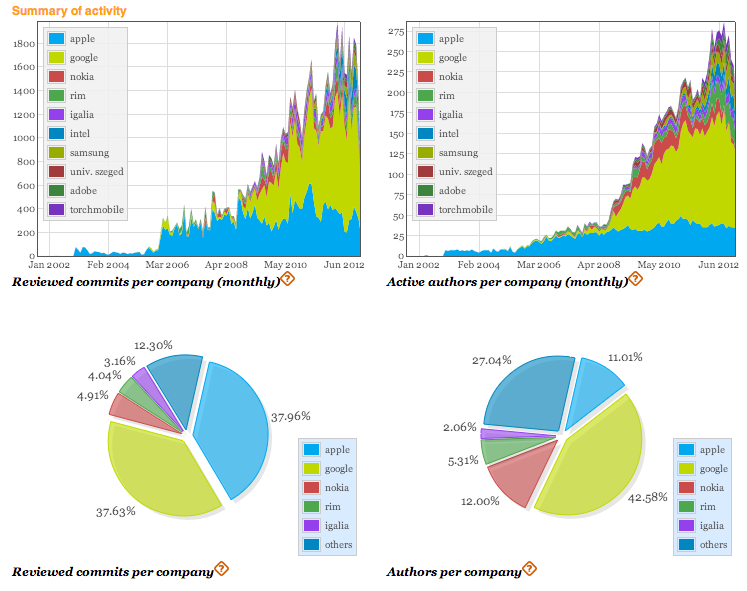 Apple still contributes the greatest number of 'reviewed commits' enhancing its open source WebKit browser engine, but Google is nearly tied in contributions while an active and expanding community assist. According to a report by TechCrunch, based on numbers crunched by Bitergia, a firm that analyzes the active participants and their contributions to open source projects, Apple's contributions to WebKit come despite a much smaller number of dedicated, individual software authors. Apple's employees make up just 11 percent of the authors contributing to WebKit's development, but those authors contribute 37.96 percent of the community's reviewed commits, Bitergia states. Apple's interest in WebKit pertains to the Mac and iOS editions of its Safari web browser, but the browser engine code is also extensively used behind the scenes for the iTunes Store, in features such as Dashboard and iTunes Extras, and is tightly integrated into a wide variety of other operating system functions and used throughout Apple's development tools. Google's share of individual WebKit authors is a whopping 42.6 percent, but its contributions in reviewed commits per company amount to a share just slightly under Apple's, at 37.63 percent. Google uses WebKit in its Chrome desktop and mobile browsers, as well as in Android and its aspiring Chrome OS, a strategy to replace Windows with a glorified web browser on lower end netbooks. Google's efforts to build and maintain its WebKit-based Chrome browser for Windows in 2008 allowed Apple to drop its own efforts to maintain Safari for Windows last summer, enabling it to devote its efforts on Safari for iOS and Mac OS X where it earns its revenues. In addition to Apple and Google, other significant contributors to WebKit include Nokia and RIM, both of which adopted WebKit in order to deliver fully functional web browsers for their own mobile platforms. However, Nokia's initial, pioneering involvement in bringing WebKit to the mobile market peaked in 2011 and has collapsed since, as the company abandoned its own Symbian and MeeGo platforms to exclusively support Microsoft's Windows Phone. Microsoft's mobile platform supplies its own browser engine that does not use WebKit, making it the only significant mobile company on earth not to do so. At the same time that Nokia abandoned WebKit, the company now known as BlackBerry picked up the torch and boldly centered its new BB OS 10 around an existing WebKit browser. After acquiring Torch Mobile in 2009, the company abandoned the smaller firm's WebKit-based Iris browser for Windows Mobile and set to work on a new browser for its own BlackBerry platform. Ten years ago in January 2003, Steve Jobs unveiled plans for Apple's own new Safari web browser, based on the new WebCore layout engine, which was the result of a year and a half effort to improve upon KDE's existing, open KHTML project. At that time, Microsoft's Internet Explorer, based on its own proprietary "Trident" or "Tasman" web engines, accounted for around 95 percent of the web browsers in use. The number of different, active contributors to WebKit has been rapidly growing since, expanding from around five in 2007 when the iPhone debuted to the current number of more than 20 major contributors. WebKit now claims the largest share of any web browser engine. WebKit now claims the largest share of any web browser engine, thanks in large part to the popularity of Google's Chrome browser on the desktop, which has surpassed both Internet Explorer and Mozilla's Firefox. WebKit's share of mobile browsers is much higher, with Safari on iOS and Google's Android and Chrome mobile browsers contributing toward a total WebKit market share comparable to what Microsoft's proprietary Trident claimed a decade ago. In addition to web browsers, WebKit also serves as the underlying technology behind a variety of other products, ranging from Valve's Steam (a sort of iTunes Store for games) to Adobe's AIR platform and HP's now defunct webOS, in addition to being used by a wide variety of apps to display and format content, including Apple's Mail and a vast array of third party iOS and Mac apps.